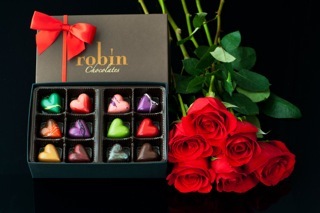 Robin Chocolates of Longmont, Colorado recently was named one of the top ten chocolate makers in North America for 2013 by Dessert Professional, the leading trade publication for chocolate, pastry, baking and ice cream professionals. 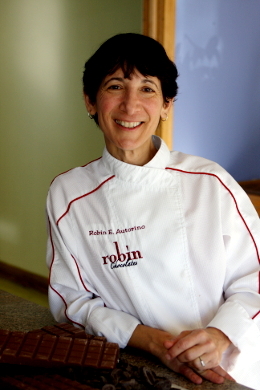 Robin Autorino spent 14 years in the Navy and later working for computer and internet companies, but she felt a calling to the culinary world. 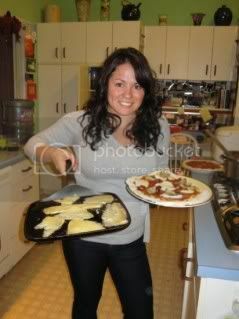 She attended Culinary School of the Rockies and had an internship at a patisserie in France where she learned to love pastries and chocolate. This led to pastry chef positions at 5-star restaurants, including the Flagstaff House in Boulder and the Brown Palace Hotel in Denver. She started her chocolate company in February 2008 after years of making caramels and hand rolled truffles for friends and in October of 2011, she opened a retail shop. Her growth has been exponential. Now with 11 employees, the family-run business (Robin’s husband Chris works with her too), it’s a great example of a thriving Colorado based company. Based on the award from Dessert Professional, Robin believes she can stand out based on the quality of chocolates they use. There is great care that goes into every piece they make, as all chocolate and confections are made by hand, using traditional, artisanal techniques. Her suppliers are around Europe and South America, that produce GMO-free cocoa powders and additive-free fruit purees and nut butters. Her suppliers also work directly with growers and cocoa plantation owners to ensure her ingredients are produced by fair trade. To commemorate her success, we’re hosting a giveaway for Grace(full) Plate readers! We will pick a winner by January 1st, 2014 and request your mailing address for it to be shipped to you. Flowers not included in chocolate gift box giveaway. Thanks to Robin for hosting the giveaway. I was not compensated for this post – all opinions as always are my own. This is yet another reason to love our area–one of the top 10 chocolate makers in the country? Yes, please! Milk chocolate – preferably combined with something crunchy, like toasted coconut, nuts, toffee. I love dark chocolate, especially with peanut butter! So glad to have Robin in Longmont!